There are times when someone produces a model accessory that you wonder why it wasn't done before. To be sure, companies like ESCI used to produce Luftwaffe badges along with several of their sheets, but they were 1/72 scale and a very long time ago. Microscale also did this sort of thing for a variety of USAF units, but it never caught on. 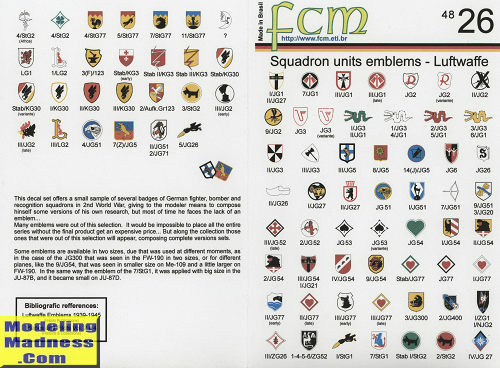 Now FCM has produced a very comprehensive sheet that seems to have pretty well covered all the Luftwaffe fighter and bomber squadrons. 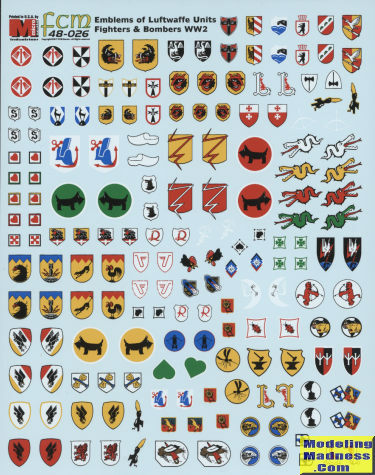 This time it is in 1/48 and has not only captured every geschwader, but also the different variation of some of the badges and that includes those of different sizes. Those who are up on this sort of thing will recognize many of them while the rest of us will need to consult the instruction sheet. Sheets like this benefit modelers in a couple of ways. First it allows planes from units that are not covered by aftermarket sheets to be modeled. Secondly, it provides good replacements for kit or other sheet markings that may not be either properly printed or are not correct. Back in the dark ages of model building before aftermarket exploded on the scene, many of us resorted to sheets like this as well as additional letter/number offerings to duplicate planes we had seen in photos for which there was no easily available sheet. In all, a great addition to your decals and one that I think the Luftwaffe modeler will find to be quite useful. Thanks to FCM for providing the review decals.